Comments From the Artist: Most of my work is done with a desert flavor and desert animals. I have been painting for 35 years, mostly in Texas before I moved to the desert in Arizona. I am a member of the Casa Grande Valley Fine Arts Association. Your idea for this painting is excellent. The Road Runner, sitting on top of the broken ancient pottery for a “look out” is GREAT! I, too, share your passion for the southwest and have always wanted to live there! I have a few comments that I would like to share with you! 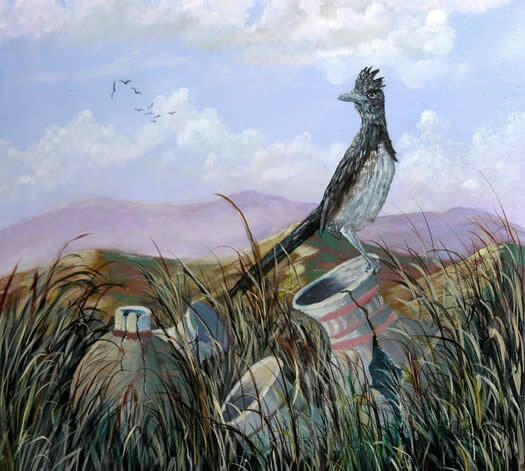 From reading your title and from looking at the composition with the Road Runner sitting on the pottery, I know that the most important area of your painting is that Road Runner sitting on that broken pot! Why not change the composition to really “PUSH” this feeling or idea. My thought is to create this in a vertical format, raising the area of the Road Runner sitting on the broken pot to the upper right third of your painting area, eliminating the mountains and the birds flying in the background. By doing this, the shapes of the Road Runner and the broken pots would take bites out of the simple shape of the blue sky and clouds. This, in turn, would draw much more attention to the focal area of your lovely painting. As it is now, the painting is cut in half……… half mountains and foreground, and half sky. The contour of the distant mountains and the closer mountains is the same (something that is very easy to do, but does not create interesting shapes)!!!!!!!!!! The question you need to ask yourself is: Do I really need all of those extra THINGS in my painting to make that statement? One other extra shape I would eliminate would be that grass shape turning away from the Road Runner. You really don’t need it! You did a FABULOUS job of painting the pots and Road Runner! Your attention to detail is wonderful within the pots and bird. My suggestion is to let us SEE this super work by eliminating the EXTRAS. The impact and drama then would be a delight for the eyes to behold! Keep practicing and keep painting! Thank you for sharing with us! I personally love the pale blue clouds and the grassy area in the foreground. I dont feel as if they take the focus way from the Road Runner. I am by no means an expert artist but the only thing that I would have changed was the darker mountains in the foreground. I loved the pale lavender mountains in the background as it gave the view a dream like quality. I almost felt like I was looking at Zazu in the Lion King. Like the colors, the shapes especially the bird(s). Good going! I didn’t even notice the darker mountains till i read your comment and took another look. I love your grasses. Wish mine looked that good. I really like your painting. Love it – your bird has real character. Found it amusing too sitting on cracked pots. Very well executed too – couldn’t fault it. I would like to thank all of those who commented on my Rod Runner. Ingrid, thank you for the construtive comment. I will take them to heart. and try a vertical format for the painting.